Are you trying to work with a late talker who has a super short attention span? You’re probably thinking… how is he ever going to learn to talk if he won’t listen and pay attention? This can be super frustrating for us as therapists and as parents because we are trying everything we can to help a child learn to communicate, yet we’re met with lots of resistance or indifference by a child who doesn’t seem to want to stay with us and play together, or to listen as we try to teach them to say new words. In this post and video, I want to share with you my best tips for helping a late talker learn to pay attention. Tip #1… Change your approach! The first issue we should tackle in this situation isn’t the child…it’s us! We should do everything we can to make a child want to pay attention. By doing these things, we’ll be addressing a child’s underlying motivation and providing reasons for them to interact with us. To begin, we need to think about how to woo late talkers to entice them to want to pay attention to us. The best way to do this is to change our own starting point when we interact with a child. We need to think about our own demeanor. Most of what we communicate to a toddler is nonverbally with our body language – meaning our facial expressions and tone of voice. Look at yourself. Listen to yourself. Would you want to be with you right now? Do you look and sound happy and cheerful or are you too serious? Are you loving and playful or strict and demanding? If it’s the latter, lighten up! Now is the time to have fun! Remember, you want to capture a child’s attention and keep him with you, not drive her away with a bad attitude! Who wants to stick around with an adult who is mean? No one… and certainly not a language-delayed toddler or preschooler! Tip #2… Avoid behavioral directives and commands. You can’t make a busy toddler stick with an activity simply by saying things like ‘Listen to me,” or “Sit down and pay attention!” You’ve probably already tried that too! It doesn’t work. With super young kids, you also can’t punish them enough to make them cooperative. That always backfires and leaves a child so upset and emotionally dysregulated that they can’t pay attention to you or learn from you. We should learn to turn off our “bossy” selves and try something different. No commands. No “do this or else.” Focus on having fun and enjoying yourself as you play together. Tip #3… Offer a “WOW” factor! For toddlers and preschoolers with fleeting attention spans, it’s best to begin with a toy or activity that includes a big visual “wow” factor and makes it virtually impossible for a child to continue to ignore you! In this Therapy Tip of the Week video, I want to show you a toy that satisfies this requirement. Most toddlers naturally gravitate toward these kinds of toys because they’re novel, but sometimes we meet kids who don’t seem to like much of anything at first. You’ll have to show them how fun the toy is and teach them how to play. Some adults begin by showing a child a cool toy and saying something like..
That rarely works because you’ve not given him any real reason to stop what he’s already doing. Some adults think they should just hand the a cool toy over to the child and see what happens. Don’t do that – it virtually guarantees you’ll be left out! Instead, keep full control of the ball so that a child doesn’t take it and turn his back on you. Play with the ball yourself and act like you are having the time of your life. Open and close the ball several times so that she can see how it works. Let’s make it big again! Remember to use your voice here to sound as fun as possible which will go a long way in helping him notice you and stay with you to check out what you’re doing. Tip #6… If the child still isn’t interested, try a simpler game. Tip #7… Use the games to teach a child to talk. For late talkers who are a little further along developmentally, you can certainly work on teaching early words. Do this with the little song and verbal routine we just discussed. Your goal is for the child to say the word that comes last in your song. Before you say the last line, lean in toward the child, use an anticipatory tone of voice and facial expression as you slowly count… “1…2…” and then look at him expectantly and wait for him to say 3. Read more about this technique here. This method is called “The Close Method” and it often sets the stage for a late talker to fill in the word. Once he’s heard the routine enough to remember it, it’s a highly effective strategy for many toddlers and preschoolers. Tip #8… If that’s not working, back up and try early sound imitation games. When it’s very near her little head, playfully scream or squeal! As you yell, quickly open the ball — that’s the exciting part for toddlers. Repeat the routine and expectantly wait for her to scream. This is an easy way to help a child begin to imitate your sounds. You may think screaming isn’t the best way to teach a child to talk, but you’ll have to begin with sounds that are easy to imitate. For more information about this approach, read this post. I also like using this toy to teach size words such as little and big. You can do that both receptively – meaning the child understands the words little and big – and expressively meaning he says the words too. Say the words “big” and “little” as you open and close the ball. Be sure to keep it fun and playful! When you’re playing together, if a child is super hard to engage and has some visual preferences, capture his attention by looking through the ball at him from different angles. This has been a super effective way for me to get a child to make and maintain eye contact with me for even a few seconds as we play together. 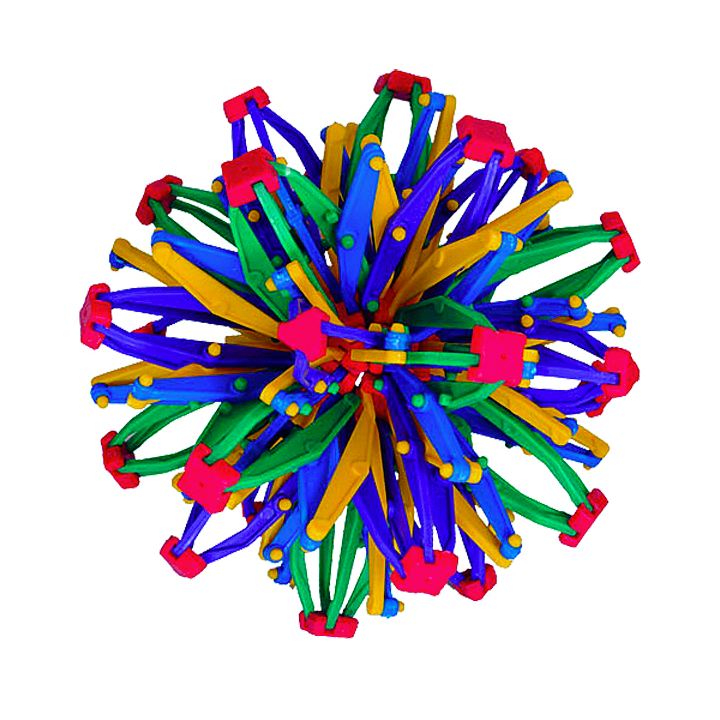 There you have it… several ways to use this cool sphere ball with late talkers to target your goals of improving attention and participation, increasing social interaction with more eye contact, and of course, saying some new words. All these goals begin with sustained attention. Helping a busy toddler improve his attention span is a key skill many late talkers must improve before we can begin to successfully teach them to talk. Many times, parents overlook the importance of these skills that must come first. Speech-language pathologists call these things prelinguistic skills. Don’t let that word intimidate you. “Pre” simply means skills that come before or first and linguistics just means language. There are 11 different prelinguistic skills all kids learn before they begin to use words to communicate. My therapy manual Let’s Talk About Talking walks you through each of those 11 skills in a very logical, sequential manner that’s easy to understand and follow. It’s super useful for parents who are working with late talkers at home and for professionals who see kids in home, clinical, and school-based programs. The book is FULL of ideas like this ball idea to target each of those all-important skills. Since its release, I’ve been flooded with emails about how successful the activities have been for both parents and therapists. If you’re working with a late talker, this manual will be the resource you reach for time and time again to give you more ideas and guide your efforts so that you can maximize your own effectiveness. Why bother doing something if it doesn’t work? The activities in Let’s Talk About Talking do work and I know you’re going to have as much success with them as I have.